Would you wear this Space Glasses to change your view of the world around you? You’ve probably heard of Google Glass by now – the specs that overlay graphics onto the world around you. It costs $1500 to own this internet-enabled glass. Now, a futuristic pair of ‘Space Glasses’ called META is going one step further by offering something called ‘mediated reality’. Like augmented reality, this technology overlays text and graphics onto your field of view. However, it can also subtract objects by scanning your environment with a camera and identifying the objects around you. Once it knows what you’re looking at, it can enhance or diminish objects’ visibility so that you can add or remove them at will. For example, imagine you're sitting in front of the telly. Meta’s built-in 720p camera will be able to recognise the TV, overlaying graphics so that it looks like they're being displayed on the screen. Or imagine you’re holding a blank sheet of paper in front of you. The glasses will recognise it and track its position, allowing the headset to ‘print’ text or graphics onto the paper. If you bend or move the paper, the text will move accordingly, while folding the paper or turning it over will hide the text as if it were really printed there. 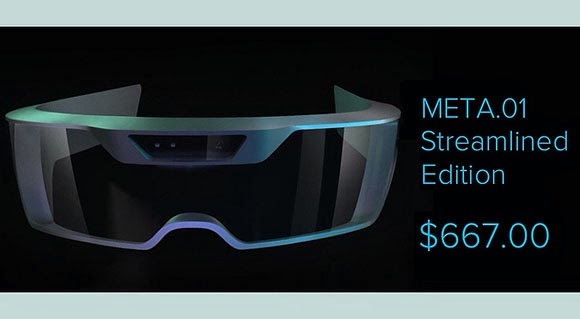 Priced at $667 (around RM2,158), Meta will be the first truly affordable mediated reality system available when it arrives in December this year. That's way cheaper compared to Google Glass at $1,500 (around RM4,850), but still, well... an expensive gadget. So, would you use a pair of Space Glasses to change your view of the world around you? I ticked the 'No' box. How about you? You can get more information at Space Glasses website. wah, interesting... kalau affordable, nak juga try.. tapi xde effect ke mata ke?